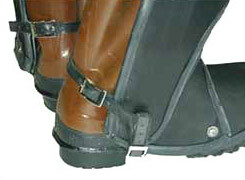 Water blasting gaiters attach easily to your boots before or after you put them on. The most important thing is to make sure that the strap under the boot is tight. Once the gaiter is fitted to your boot, it is not necessary to remove it. 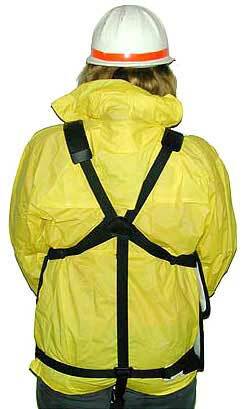 Rinse the waterblasting gaiter daily with soap and water to decontaminate — never use bleach. 1. Hold gaiter on the boot and attach strap under the foot. Strap goes in front of the heel and should be pulled tight so that the loop does not hang under your foot. If the gaiter is worn too high, it will work its way down the boot, causing the strap under the heel to become loose and not protect properly. 2. Attach the straps around the back of the boot so they are snug but not so tight that they are uncomfortable or crush the boot. 3. After wearing the waterblasting gaiters for about 10 minutes, check the strap under the boot. If it has come loose, tighten it again (now you should be all set). 1. 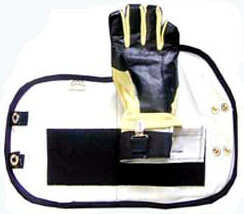 Clip in any style glove that fits your working environment. 2. Adjust the Velcro overlap to fit your desired arm length. 3. If desired, the gloves may be left attached to the waterblasting gauntlet for quick and easy removal. 1. Unbuckle the belt. Place chaps around your waist so the side-release buckles are on the outside of your leg. Attach belt buckle. 2. Adjust the length of the leg by overlapping the thigh and hip pads. Make sure the knee pad falls on your knee. Attaching the first buckle above the knee prior to adjustment will hold the armor in place and help the Velcro connection follow the curve of your leg. 3. 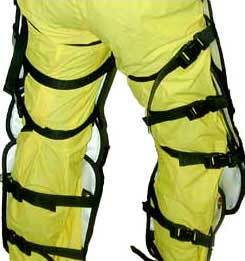 Attach five leg straps and tighten. Do not over tighten. If chaps are a little loose, they will be more comfortable. 4. Check leg length. Does your knee hit the knee pad? Do the top of the chaps bind when you bend over? If yes, adjust Velcro at thigh for proper alignment. 1. Slide vest over your head. Place arms through the straps, and tighten as desired. 2. Attach white buckle to white fastener at waist, and tighten as desired. 3. Attach black buckle to black fastener between the legs, and tighten as desired. 4. Slide the shoulder pads into desired position for comfort. Clean suit with soap and water — never use bleach. Hang in cool, dry area. A canvas or garment bag is recmmended for transport to and from job sites.